Oh, I'm out of order now. I still haven't had a chance to do LOAD #11. I know what I want to do, it's all laid out, I just need the time to do it. I just don't get as much scrappy time on the weekends. Anyway, on to LOAD #12 and today's prompt is: History repeats itself. Again, there are any number of things I could have done, but I knew 3 things already...I wanted to use these photos of my son's band concert for the Club CK ThanksLiving Challenge #2, and also the Club CK CHA trend Challenge, I was tremendously inspired by the Frosted Designs 2/7 Sketch. So I decided that history has repeated itself by my son being in the school band, just like I was, but also, that I am just thankful we still have music in our schools. So, for this LO, I used the Frosted Designs sketch, but I flipped it so the photos go left to right instead of right to left. This was a great sketch for these photos for a lot of reasons. I had one central photo and 2 small ones to focus on. It allowed me to use some embellishments to highlight not only the photos, but the theme of the LO as well. I just knew right away, this was going to work for these photos! Orange is a hard color to use. Really? NEON orange band shirts that had to be photographed indoors in bad florescent lighting. Yeesh. So, I chose to use more orange PP to complement the photos rather than try to contrast them and just set it on black CS. I was concerned it might look like Halloween, but I don't think it does at all. I took a close up photo of the medal my son received, and printed multiples, cut them out and make them the banner to reinforce the music theme. I added metal brads and the metal round clips to play off the brass trumpet. 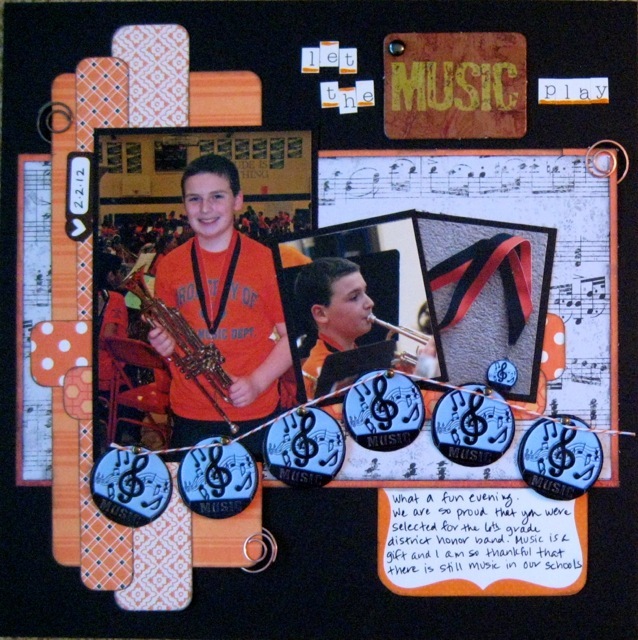 I also had this chipboard piece with the word music on it that I wanted to stand out, so I used smaller letter stickers. I am really happy with how this turned out. Devra, this is great! I love the banner!! What a great layout! I really do love the orange that you used to really make your son's shirt pop. Very nicely done! I also agree with Stacia, I really love the banner. It really adds to the layout just perfectly. Perfect layering of the strips of PP! Neat banner with a cool title! I just love this! I have a trumpet player too! The note banner is wonderful! Thanks for joining us for our latest sketch challenge over at Frosted Designs. You did a lovely job with the orange. It is a hard colour to scrap with. At least for me. :) Love you page! Thanks for playing along with us at Frosted Designs!